We continue to ramp up to November’s heavy hitters with some ambitious and well-reviewed releases, plus an obligatory horror film just in time for Halloween. The likely box office champ this week is Ouija, which really when you get down to it is the first board game adaptation since 2012’s Battleship. If that doesn’t sound scary to you, it’s from Michael Bay’s production company. In the movie, a group of teenagers (played by nobody you’ve heard of, all of whom are in their late 20s) attempt to contact their recently deceased friend via Ouija board and accidentally unleash dark and evil spirits that begin terrorizing them. I’m really not sure this is the tie-in Hasbro wanted, but it only cost $5 million to make so they’re basically printing money. It’s predictably getting destroyed by critics and I’m a little surprised that they even bothered to screen it, since it’s in the most bulletproof genre there is. That said, 2014 has been a pretty lousy year for horror at the box office until this month's Annabelle. This is your de facto Halloween release since the holiday falls on a Friday this year and is traditionally a notoriously awful day of box office. That alone will make it a success and it appears to have the inside track on winning the weekend with around $19 million. After flopping badly last December with some indeterminate number of ronin, Keanu Reeves returns with John Wick. 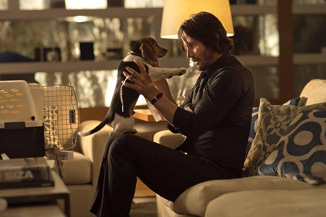 It veers a little too close to the trope of “retired assassin pulled back in after the wrong people mess with him” but seems to do so with a bit of a wink, as Reeves’ title character is after revenge after the death of his dog. No, really. It also stars Willem Dafoe, Adrianne Palicki and Michael Nyqvist. Somehow an original idea and not based on a graphic novel, book, other film, John Wick is landing extremely positive reviews for its stylish look and action set pieces, which is something Reeves' career needed after a few years without a genuine hit. It even has franchise potential should it play well with audiences. Lionsgate seems to be hedging their bets some by putting it in just under 2,600 theaters, but word-of-mouth is something that can carry this type of movie. There’s potential for a real breakout here given the strong reviews, but Ouija should have a clear path to the weekend title. Look for a weekend of around $14 million.